January 25 is Burns’ Night (the date of Burns’ birth) and tributary suppers are held not just in Scotland but all around the world – wherever there are Scots. Burns’ Supper was originally started by a group of his friends and acquaintances a few years after his death, to honour his memory. The menu is iconically traditional with a haggis as the centrepiece. Burns referred to it as the ‘great chieftan o’ the puddin’-race’. The accompaniments to the haggis are neeps and tatties – turnip and potatoes – served mashed. Traditionally the haggis is piped in and then addressed – the recitation of a Burns poem called ‘Address to a Haggis’ (go figure). If there is a large gathering there is an ‘Address to the Lasses’ – which commemorates Burns’ fondness for them. If a small supper then its usually just the ‘Selkirk Grace’. Essentially its a celebration of plain country food and plan country folk of whom Burns was a champion. Plain country food in Australia, haggis is not. Cooking your own haggis is out of the question. There are a number of butchers scattered around Sydney who make haggis but usually you have to order these in advance or else travel to the ends of the earth (St Mary’s). Fortunately we found a supplier (Farmer Giles) selling these and other Scottish fare at the Bondi markets. Hot, hot, hot on Saturday so husband and daughter sent off early to the markets to purchase produce, leaving me to sleep. Daughter is learning to drive so this was a good opportunity for her to get in some much needed practice hours (otherwise I doubt she would have chosen to embark on that journey). Unbeknownst to me, having obtained all things necessary at the markets they then went off to the beach for a swim. I meanwhile sat sweltering in a lounge chair outside reading the digital news. 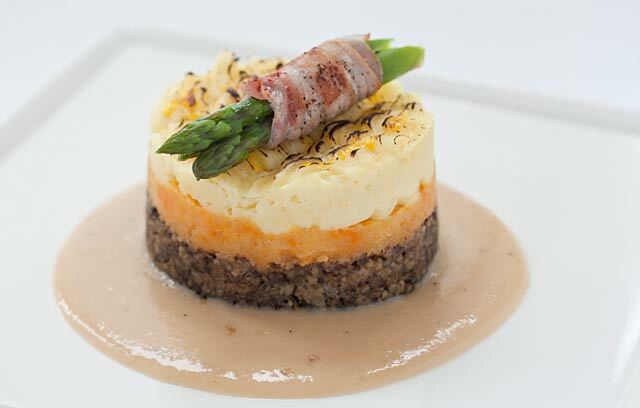 So we searched and found a nice form of presenting this dish: in a stack with a layer of haggis, a layer of mashed potatoes with spring onion folded thought and then a layer of mashed swedes (nice orange colour) brushed with egg yolk and cooked in the oven and then topped with asparagus tips wrapped in crisp pancetta and served with a whisky cream sauce. I had one vegetarian guest so I decided that given this dinner centred around a haggis I would have to make a vegetarian haggis for her rather than something entirely different. I also thought I’d better make a few extra just in case anyone was truly put off by haggis. The vegetarian version had split peas, barley, chopped onion, garlic, carrot, steel cut oats (which are tiny and coarse) and lots of pepper and freshly ground and toasted allspice. I was pleased with the end result – it had the same texture and flavour as the haggis (well, almost). I was also pleased at how much people enjoyed the real thing. Truly delicious – you just have to not think about what it consists of, but then again, if you don’t mind offal – pate anyone? – then you probably won’t object to haggis. 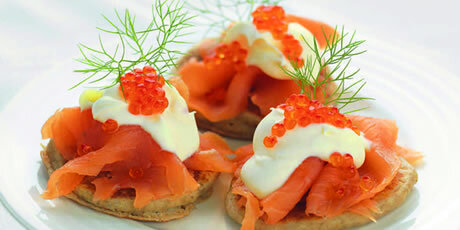 To start I had champagne and smoked salmon with horseradish and creme fraiche. 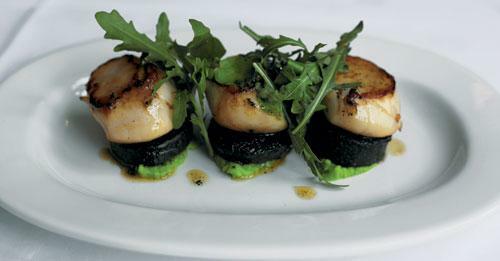 For entree I made a dish of seared scallops on black pudding discs with a pea and mint puree, drizzled with chilli oil. 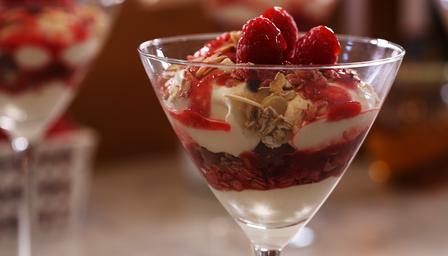 And for desert, another classical Burns’ supper dish – Cranachan, which is like a trifle with layers of whisky cream, freshly pureed raspberries, toasted oats and flaked almonds and topped with fresh raspberries. Whisky is of course the canonical accompaniament to haggis – it doesn’t go too badly with the desert either – but of course a good red wine is also in order. So my husband having said grace (see below) and then the address we ate and drank good plain Scottish food and gave Burns not another thought.